If you're visiting Morocco for any length of time, grab the opportunity to travel a little further afield from Marrakech than the Palmeraie. Some of the best places to stay in Morocco are hotels near Marrakech, but far enough away to feel as if you've escaped away from the hurly burley. Within an hour or so of the city, you will discover majestic countryside, breathtaking views and some fabulous properties to stay in. If you don't fancy straying too far from the city, then the Jardins d'Issil in the outskirts is the perfect compromise. 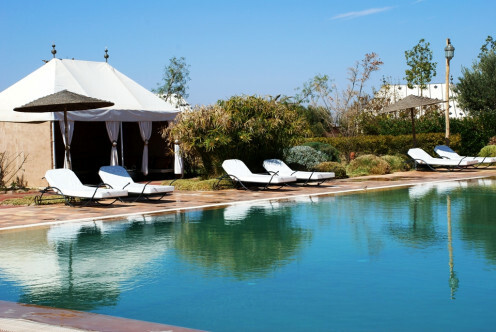 The cluster of Caidal tents which provide the accommodation are set around a large infinity pool amid scented gardens. The vibe here is very relaxed and the food excellent. The world famous Amanjena is also not too far from central Marrakech, though it’s not one to look at if you're on a budget! Dar Layyina is a charming property with just 7 rooms and suites only 15 minutes from central Marrakech. With lovely gardens and two outdoor pools, it's the perfect pick for those who want the best of town and country. And, even better, rooms start from just €70 per night including breakfast. The High Atlas mountains are a wonderful region to trek, climb, or even relax amongst epic scenery, where Berber villages cling to steep hillsides. And yet the Atlas mountains are close enough to Marrakech for hotels there to qualify for our list of hotels near Marrakech. 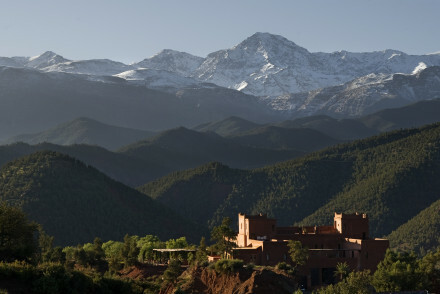 The Kasbah du Toubkal ticks all the boxes in terms of authentic feel and spectacular views. It also boasts eco credentials with its Green Globe award for sustainable tourism and is very family friendly. 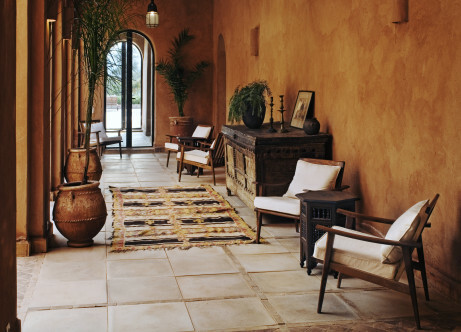 But for out and out luxury book into the Kasbah Tamadot, Sir Richard Branson's High Atlas pad, with its stunning bedrooms, breathtaking views and five star spa. 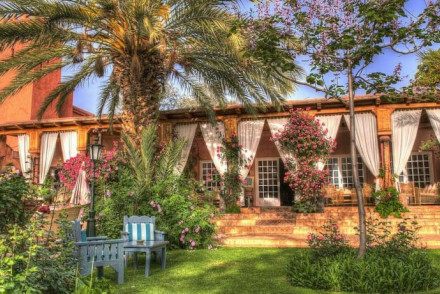 or if your budget is restricted book a room in Dar Adrar, a simple, rustic guesthouse perched in the mountains above Imlil. Here you get all the views and solitude without the altitude sickness! The Domaine de la Roseraie offers spacious bedrooms in bungalows scattered around exotic gardens. Or there’s the Kasbah Angour, a gorgeous Berber castle converted to a hotel, but with much of its traditional charm, and furniture retained. 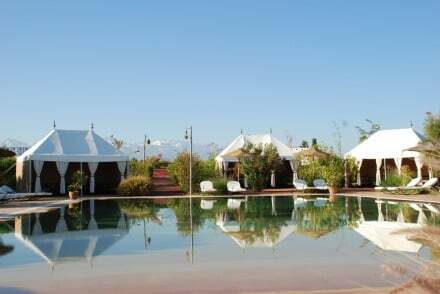 A cluster of caïdal tents in the rugged countryside fringing Marrakech. Enchanting Moroccan interiors set a romantic tone with flowing drapes, candles and cushions. Dine on local dishes in the dappled shade of the aromatic gardens. True paradise! Exceptional charm at this small hotel formed from a collection of village dwellings. Open fireplaces, rich silks, shaded courtyards, beautiful gardens,and celestial mountain views serve to create a true sense of wellbeing. The Moroccan chic rooms are comfortable and full of thoughtful touches. Total relaxation - Designed with relaxation in mind find quite corners, meandering paths through stunning gardens and suprise plunge pools. Value chic - Moroccan chic at very affordable rates with lovely pool, charming rooms, stylish interiors and plenty of charm. Local markets - Spend a day in the bustling Marrakesh souks, a delight for all the senses. World famous luxury hotel. This tranquil retreat pays homage to North Africa's stark beauty - sun-paled red walls, rose strewn fountains. Pavilion style rooms with proportions worthy of a Pasha. The spa that goes above and beyond. A 'peaceful paradise' that breathes romance and beauty. Romantic Break - Think king-sized beds beneath up-lit Venetian stuc domes and private dining in your softly lit dining hall. Total relaxation - Lounge by one of the many pools, indulge in candlelit oil massages and sessions in the Hammam. Sights nearby - Situated near Marrakech the red-walled former fortress crisscrossed by narrow lanes. Great walks - Stroll aorund the lovely lush gardens, a haven for birds and butterflies. An eco-friendly resort perched on the side of the Atlas Mountains. The rooms range from economy dorms to luxurious havens. Moroccan chic decor with exposed wood beams, whitewash walls and bright fabrics. Indescribable views. The delicious food and lovely hosts seal the deal. Active Holiday - This is the perfect spot to set off on a once ina lifetime trekking experience, not for the faint hearted! Trekking - This is trekking country- Choose from the Flexible 6-day trekking package or the 2-day ascent of Toubkal. Eco break - it employs locals, funds the Village Association and has won a Green Globe for sustainable tourism. Child friendly - Plenty of activities on and off site. 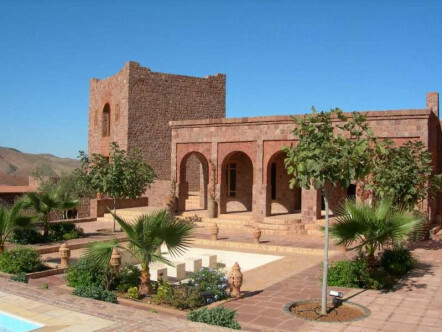 Richard Branson's exclusive Moroccan hideaway. The ultimate luxury break - 5-star spa, undulating rose gardens, celestial valley views from its hilltop perch, gourmet feasts. Want for nothing in this Atlas heaven. Active Holiday - With a range of trekking options from north Africa's highest peak Jbel Toubkal to a gentle hike down the river to Asni village. Honeymoons - Romantic suites with wonderful views, charming touches and private dining. Value chic - With stylish rooms starting from just €70 per night, this is great value. Swimming Pool - There are two outdoor pools, the larger one has a sound system and the smaller one is heated. Sights nearby - With Marrakech just 15 minutes away, you're wihin easy reach of all the sights. A stunning escape in the foothills of the Atlas mountains less than an hour from Marrakech. With staggering mountain views - this is the perfect place for enthusiastic trekkers as well as those who want to relax. 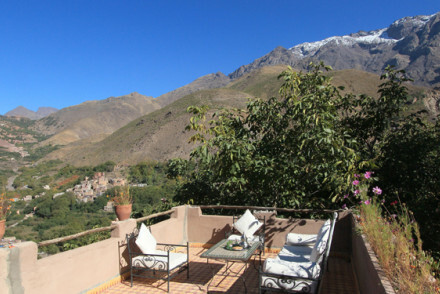 A simple and charmingly rustic guesthouse perched in the High Atlas mountains above Imlil. Great walks - Ideal base if you're climbing Mt Toubkal. Owner can arrange guided walks of the area. Traditional hotel in the foothills of the Atlas mountains. 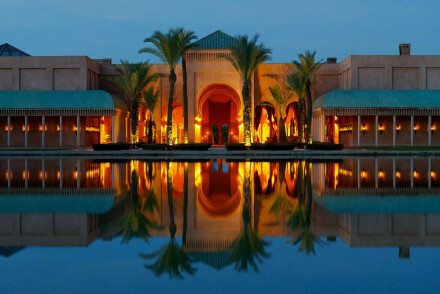 Large, unpretentious bedrooms with traditional Moroccan features set scattered through exotic gardens. Lovely swimming pool and seasonal cooking. A spa and hammam to completely unwind in. Ideal for nature lovers. Romantic Break - The hotel offers couples massages and Hammam sessions plus romantic dinner for two on your first night. 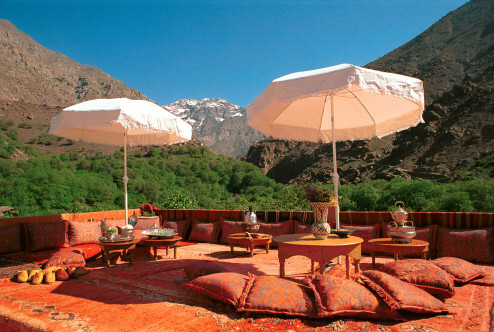 Active Holiday - Ideally situated to explore the Atlas Mountains either on foot or on horseback. Great walks - Take a walk around the 60 acres of rose filled parkland the hotel sits in. 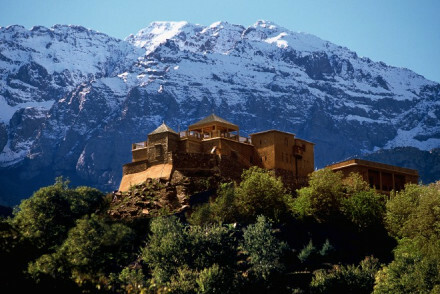 Gorgeous Berber castle in foothills of the Atlas Mountains. 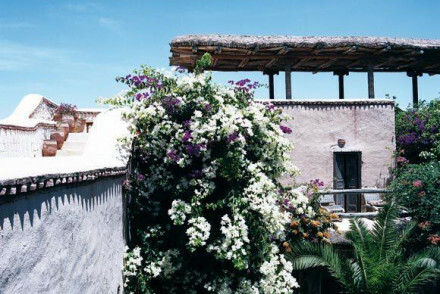 Superb panoramic views, suites with traditional Moroccan materials and locally made furniture. Beautiful gardens, a large swimming pool and wonderful local excursions. A relaxing spot to recoup in after a day of activity.